Home » creative » Facebook » Food n Beverage » GSC Movies » movie » PappaRich » tag » travel contest » video » PappaRich Pappa's Day Contest: Win a trip abroad worth RM10,000! 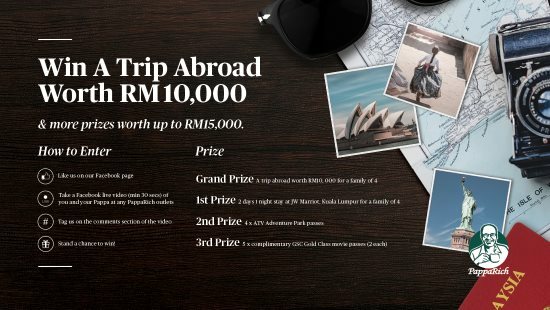 PappaRich Pappa's Day Contest: Win a trip abroad worth RM10,000! Grand Prize: A trip abroad worth RM10,000 for a family of 4. 1st Prize: 2 days 1 night stay at JW Marriot, Kuala Lumpur for a family of 4. Take your dad out to any of PappaRich's outlets for a meal. Take a minimum 30 seconds of Facebook Live Video of you and your dad. Post the video on Facebook and tag PappaRich on the comments section of the video. Visit PappaRich Pappa's Day Contest page for more details.